For most senior-level executives, failure isn’t a step backward; it’s an excellent stepping stone to success. In fact, most leaders I’ve spoken to believe that you never learn to move out of your comfort zone if you don’t overcome your fear of failure. One such executive is Kira Wampler, the Silicon Valley technologist, product and marketing leader who is currently the CEO of Art.com. Speaking on a panel at the Women in Retail Leadership Circle’s On the Road event in San Francisco last November, Wampler explained why failure is essential to success (see video snippet below). In addition, Wampler said that if you’ve grown up in your career in technology organizations or engineering cultures, you’d see how in those types of companies, failure is acceptable and even embraced. Wampler admitted that in some organizations, this type of thinking is easier said than done. “Some companies really embrace experimentation, testing and risk-taking and others don’t,” she said. However, she added that companies can manage the risk of experimentation by creating a budget for it. “When I was in marketing, product management or today, at a dot-com, we [have always been] pretty clear on where we are taking risks and walling off that risk and that experimentation so that if something goes wrong, it doesn’t affect the entire business,” Wampler said. How do your companies approach testing, experimentation and the risk of failure? We’d love to hear from you about this important topic! Please let me know by sending a note to mcampanelli@napco.com. 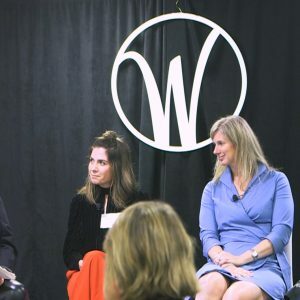 To hear more about embracing failure, as well as managing across diverse company cultures, balancing career and family, taking risks, and more, Women in Retail Leadership Circle members can watch the full video of the Leadership Panel from WIRLC On the Road: San Francisco here. Along with Wampler from Art.com, the panel features Ani Hadjinian, president, Stella & Dot; and Michelle Farabaugh, chief marketing officer, Harry & David. If you’re not a WIRLC member, click here to apply to become a member. WIRLC members receive many benefits, such as access to premium content, networking opportunities with executive-level women, discounts to our annual Summit, and more. Join us today!